RUSH: Greetings, my friends. 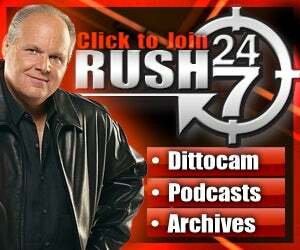 I am Rush Limbaugh, just like the brand-new MacBook Pro, thinner and more powerful, and easy to see. Well, what a machine that is. But, have some things on Apple later. I’m gonna relate Apple to Obama and teachers and cops, firefighters. I am still struggling, folks, trying to explain in an understandable way what I was trying to explain yesterday. Greetings and great to have you. Telephone number is 800-282-2882, if you want to appear on the program, if we go to the phones. Yesterday we had the sound bites from the Sunday shows. Axelrod — and Obama himself — talking about the private sector’s fine, what we need are more teachers and firefighters and cops. And, if you remember the discussion yesterday, I was struggling mightily trying to explain to you why I know that that is old-fashioned, 50-year-old thinking linked to Marxism, but I don’t think that I made it understandable. I’ve been struggling with this ever since the program ended yesterday. Well, I took four hours off to immerse myself in the Apple stuff, but then, after I had done that, I got right back into this, and I’d been really thinking about it, in a way to try to explain it because it’s so illustrative. And yet here’s Obama saying the private sector’s fine. We need more cops and firefighters and teachers. That equals jobs. Nothing about productivity. Nothing about innovation and so forth. But that still doesn’t quite get me there. In a nutshell, the federal government’s own statistics show just how out of touch Obama’s comments about the private sector really are. If you look at payroll changes since January of 2008, the private sector has gone down by 4.6 million jobs. That’s a 4% decline. Meanwhile, all of government, federal and local, state, whole shooting match, has only declined by 407,000 jobs, four million versus 400,000. That’s a 1.8% drop. And since January of 2008, the number of federal government jobs has grown by 225,000, which equals an 11.4% increase. And these numbers come from the federal government, Bureau of Labor Statistics and so forth. So clearly Obama was as wrong as anybody could be about this, but in his mind he wasn’t. The private sector always does fine. It’s always there. Private sector’s cool. He’s got an ignorance combined with an arrogant condescension about it. He thinks he knows everything about it. He doesn’t know anything about it. And those two things combined equal an arrogant condescension and a dangerous lack of understanding that should never occupy such a position of power in this country. I was frustrated by this whole topic yesterday, and I was concerned that when I started talking about the productive aspects of work that it would be taken as an insult to police officers and firefighters and teachers. We like them. I don’t want to offend anybody here. Never, ever, want to offend anybody. And I said numerous times yesterday I’ve gotta be very careful with this. I was talking about growth, and that’s where I’m gonna intertwine a short little passage about some Apple innovation with all this that will help to illustrate it. But before I get there, I need to touch this subject in a more generalized way. We all assume that teachers and firefighters and cops are exclusive members of the public sector. I think that the problem that I was having yesterday is in that fundamental concession that may not be necessary to make, that cops, firefighters, and teachers belong to the public sector. Because you could make an argument that they don’t. Now, Obama says they do, but the thing you have to understand about Obama, he’s not really talking about the jobs of police officers, firefighters, and school teachers. And this is what I didn’t make clear yesterday about my level of understanding here. When Obama and Axelrod talk about putting more cops and firemen and teachers in the classrooms, on the street putting out fires, he’s not talking about the jobs that they do. He’s talking about their unions, and he’s talking about the way these functions are co-opted by the public sector in the big cities in the blue states, which has created a presumption among a lot of people that they are public sector jobs. Now, millions of Americans, most of whom are not wealthy, pay additional money to send their children to private schools in order to keep them out of dysfunctional public sector school systems that we all rightly decry and criticize. American men and women all over the country serve as volunteer firefighters on behalf of their communities and their taxes are confiscated to pay for public schools and big city fire companies. But they choose to pay more for the value having these jobs done right creates. I mean there is value in what these people do. This touches on the whole argument about productivity. In the sense that there’s no entrepreneurism in being a police officer and that there’s no productivity, maybe so, but there’s value. And the value has to be calculated. It’s a mistake to try to calculate that value the way we calculate the value of entrepreneurism or commerce or what have you. There are measurable ways to determine productivity. And there are with teachers. How well do the students do, for example, is one way. But there’s no direct financial relationship until you find out how well the student does in the world. And who can keep track of all that? The bottom line, there is value that having these jobs done right creates. Now, if the states went bankrupt tomorrow, what would happen is that communities would come up with their own police forces. People would do this if the state or the municipality went bankrupt and was not able to, the community would come together and do that. And the history of the United States, education and security, from crime and catastrophe, has always been part of the private sector. This is what I was struggling with yesterday, why I knew that I had to be careful here. Education and security have always been part of the private sector. I did not mean to say that there is no value created yesterday when I was talking about the job of teaching, policing, and firefighting. They are fundamental to the assurance that we have a civil society and which economic activity can flourish. They have a value that can be measured like anything else. Now, let’s bring Obama back into this. Obama is flaking for the unions and big government, and he’s always urging there has to be more and more and more. It doesn’t matter how many we have. It doesn’t matter how well they’re doing their jobs or how poorly they’re doing their jobs or whatever value we assign, there has to be more. There’s no end to how many more cops, firefighters, teachers, and public sector employees, union employees, that we must have. There’s no end to it. Now, as I say, they have a value that could be measured. But a community of, say, 25,000 people doesn’t need 1,000 more teachers. Maybe it’s got plenty if it has a few hundred good ones. If it has 80 good cops, that might be enough. It may go a whole year with no fires but if it has an effective volunteer emergency force that’s on duty and reacts whenever there is a fire, somebody needs an ambulance, doesn’t need to hire 200 firefighters at union wages and benefits. Most communities have what they need in this regard. And the assumption that we don’t is another thing that offends me here. What do you mean, we don’t have enough teachers? We have plenty. In fact, people are escaping the public sector school system because it’s not good, in their view, where they live in some cases. We don’t have a shortage of teachers. We don’t have a shortage of police officers. We don’t have a shortage of firefighters. But listen to these guys talk: “We need more of them, and that equals economic growth! This equals a solution to our economic problems.” And, of course, it doesn’t. Again, not to offend about that work, but as I said yesterday: When was the last time you went to a police officer or teacher or a firefighter to apply for a job? They have a value, but it’s not measured in the same way that traditional economic output is. Now, the trick here is not to fall for Obama’s insistence that these are public sector tasks. I mean, they may be hired by municipalities and so forth, but they have a different relationship — teachers, firefighters, and cops — with members of the community than other government employees. Even in big cities. Big cities, you might have a better argument that municipalities should provide police and fire service since you have a lot of people living in close quarters that could be destroyed if violence and fires are not contained quickly. But, see, in Obama’s ever-expanding public sector, when he says, “We always have to have more teachers and firefighters and police regardless of whether we have enough to suit our needs,” he’s not talking about in-classroom educators or guys climbing the ladders to put out a fire and other guys chasing down the bad guys. When he talks about “teachers, firefighters, and cops,” those are broadly defined terms. He’s talking about “diversity administrators,” for example. We need more bilingual education coordinators, community liaisons, government-related jobs. I guarantee you if there were a piece of legislation that said, “We’re gonna hire more cops and firefighters and so forth and so on,” these are the kind of jobs he would fill. The stimulus was used practically exclusively to either hire teachers or to ensure that they weren’t fired. The stimulus was not used as it was promised: for productivity jobs. Digging ditches. Or building roads, bridges, and rebuilding schools or what have you. It all went to what Obama really means when he talks about teachers and firefighters and cops. And that’s people behind the scenes that you never see who are busy corrupting our civil society as it exists and perverting it: Community organizers, community liaisons, government-relation directors, sensitivity trainers, regulatory compliance officers, and things of that nature. Paper shuffling. Union-wage benefit sinecures that create zero value and drag down economic activity. That’s what he’s talking about when he wants to hire cops, teachers, and police officers. He’s just using the terms. Because, as I said yesterday, “Who doesn’t want protection? Who doesn’t want an adequate firefighting force? Who doesn’t want good teachers in the neighborhood?” That’s why I was struggling yesterday. You gotta be careful because you can’t… I didn’t want to sound as though I was coming out against the whole notion of having teachers and firemen and police officers. The point is, we’re not in a shortage of those jobs, and yet Obama wants more of them. But he’s not specifically talking about beat cops, and firemen that climb the ladder, and teachers in the classroom. I guess the real point here is they are part of the community. We live and work side by side with them. I didn’t want to create this line of demarcation where they are public sector and that equals the bad guys. That’s not what I was saying, and I didn’t want anybody even infer that. They are with us, those of us in the private sector. They interact with us in the private sector, and they are different. They’re not bureaucrats. They’re not behind-the-scenes regulators that you never interact with, or very rarely. But these people — the cops, the firemen, the teachers — create the essentials of civil society. And Obama wants that to be seen as a public sector gig because he wants the public sector seen in a great, great positive way. RUSH: Okay, here’s the thing: The police are great. They don’t create wealth. They protect it. That’s crucial. They protect wealth. Firemen, they’re also wonderful and great. They don’t create wealth, but they, too, protect it. Teachers are wonderful profession. They help educate people to become good citizens, which is their job, so that citizens can then go create wealth. But they don’t create the wealth themselves. One of the things that’s happened… You know, we need these people. They are us! They’re as much in the community as we are. They are not bureaucrats. But look what’s happened here. We don’t want to make promises that we can’t keep. These pensions and health programs and retirement in perpetuity for 30 years, what does that end up doing? It ends up dividing. And the union members — the cops and the firefighters and teachers — they all get caught in the middle. A Democrat Party money-laundering scheme has created financial burdens that are impossible to pay for now. But we have the cops and the firefighters who work to protect the wealth created and the security (including their own), and the teachers who, theoretically, educate people to be good citizens so that they can go forth and create wealth and become productive themselves. But what got in the middle here? Why are we divided? And I would submit to you it’s because of the unions. These jobs became unionized. Then, all of a sudden, there became opposition between us and people that do this work. And that division was intentional. And the war between the citizens was intentional. And if not for the unions and so forth, there wouldn’t be all of this friction. RUSH: Ladies and gentlemen, look at Detroit, if you will. Does Detroit need more cops right now? Does Detroit need more teachers and firemen? No. Detroit needs more private sector growth. And this as an illustration of the point. Detroit’s in big trouble. Here’s Obama and Axelrod, “Well, we need more jobs, firemen, teachers.” That’s not gonna help Detroit right now. So why do Obama and Axelrod want it? Because they’re talking about actually more bureaucrats. It’s more control. As I said yesterday, I don’t know if these people are really this dense, or if they’ve just been so ill-educated in the schools of Marxism and Leninism. It’s one of two things. They either really don’t know what they’re doing, or they know exactly what they’re doing and are just trying to make it as palatable as possible with language they think everybody would understand and end up unwittingly supporting. But I have to tell you, you go back to the 2008 campaign and everybody thought, wow, how brilliant Axelrod and Plouffe and these guys are that ran Obama’s campaign, how brilliant Obama was. Look at ’em now, and they’re clueless. They don’t know what to do. They are out of ideas, and they know they can’t run on anything Obama has done. And yet they are. They’re running on an additional stimulus. More cops, more teachers, more firefighters. More jobs: Who cares what kind they are?